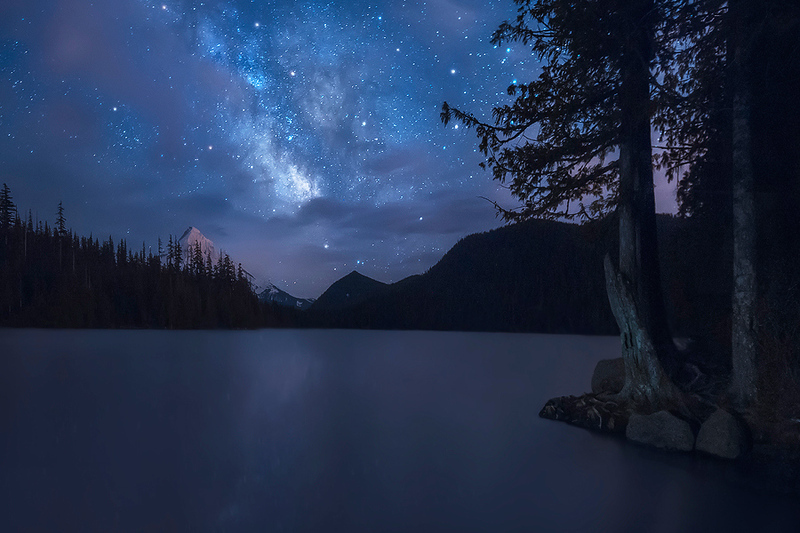 I've been wanting to get up to Lost Lake to shoot the Milky Way for a while now. After a few failed attempts in the past with clouds covering the sky I finally got a few shots I liked this past weekend. There were intermittent clouds, so I waited and waited and waited until the Mount Hood ( approx 11,000 feet ) and the Milky Way were visible to click off my shutter. In this photo I really wanted to convey the soft light and color tones that the stars leave on the water and surrounding landscapes when there is not much ambient city light to ruin the scene. After standing there long enough, and letting your eyes adjust, the stars twinkle brightly in the water. Thoughts, critique and comments always welcome! This is a single exposure processed in Lightroom & Photoshop.